Welcome to our Canadian Film Award Archive. This page contains information about the 2nd annual Canadian Screen Awards, held in March of 2014, celebrating Canadian film and television projects completed in the previous year. Also see Northernstars pages detailing the Canadian Film Awards, the Genie Awards and Les Prix Jutra. The 1st Canadian Screen Awards were held on March 3, 2013. These new awards were created following a decision by the Academy of Canadian Cinema and Television to merge its formerly separate Genie Awards (for film) and Gemini Awards (for television) into a single ceremony. 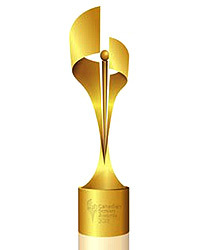 The Canadian Screen Awards also include awards for achievements in digital media. The inaugural awards broadcast gala was hosted by Martin Short. The awards for television have been edited for space. Lifestyle Program or Series:You Gotta Eat Here! Click here for a list of the winners at the 2013 Canadian Screen Awards.